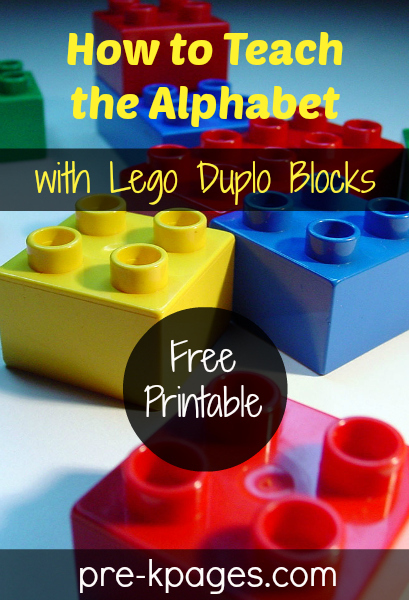 Do your kids love Lego Duplo blocks? I’ve never met a preschool or kindergarten child who didn’t! So why not teach the alphabet by leveraging this interest and using this classic toy as a vehicle? When you use high interest materials such as Lego Duplo blocks to teach an academic skill it motivates and engages young children. And better yet, research has proven that when children are motivated and engaged they learn more. First, write the letters on the Lego Duplo blocks with your permanent marker. I wrote the uppercase letters on 26 blocks and did the same for the lowercase. Next, I placed the blocks in my alphabet center along with some crayons and copies of the recording sheet. Students are invited to find the matching upper and lowercase blocks, connect them and then place them on their recording sheet. If they are able, they can write the letters on the sheet using the crayons. 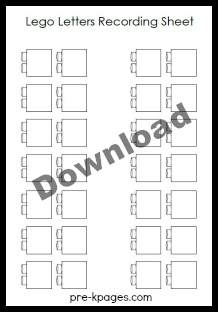 Click on the image above to download your free letter matching recording sheet. For students who are not ready for the challenge of matching upper to lowercase letters, create two sets of uppercase letters and invite them to match upper to uppercase. You can place the recording sheet in a sheet protector or make your own dry erase sleeves to save paper. You could also invite your students to wear hard hats while participating in this activity to show they are busy “working.” Plastic hard hats can usually be found at the dollar store. When children play with Lego Duplo blocks they are also developing fine motor skills and hand-eye coordination as they grasp, put together, and take apart the blocks. Spring is almost here and spring means garage sales. At garage sales you can find plenty of Lego Duplo blocks on the cheap! You can also try your local thrift stores. I found a large set of blocks called Mega Blocks at my local Wal-Mart; they are inexpensive but very similar to Lego Duplo blocks and work just as well. Follow my Alphabet board on Pinterest for more great ideas! Thank you for all the wonderful activities! I recently had my class to help with the animal shelter project. Our local animal shelter was very pleased with all the wonderful goodies. I’m so glad you and your students were able to help your local animal shelter Donna, thanks for sharing! I have had a hard time finding the leggos with the 4 holes on top. Any suggestions? I have had this acitivity since September but need the blocks. The only ones I could fine were the chunky ones. Hi Michele, thanks for stopping by! 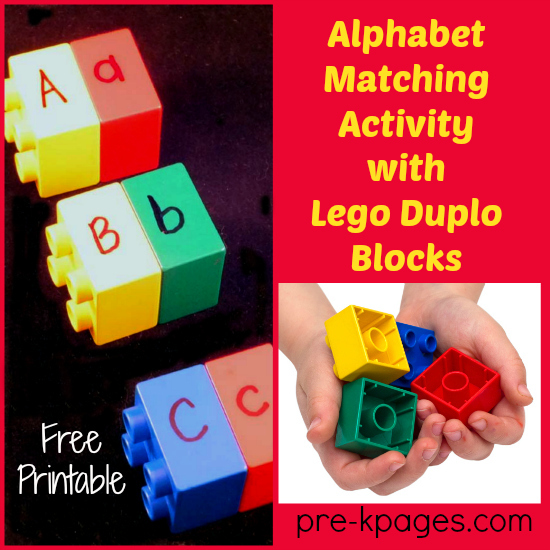 This activity uses Duplo blocks which are the chunky ones for toddlers. The regular sized Legos are too small. If you are looking for the chunky Duplo sized blocks I found a large set at Wal-Mart in the teacher section for $9.99, they’re called Mega blocks. Hope that helps! I didn’t know Walmart had a teacher section. Thank you I will look. Well, not all Wal-Marts were created equal Michele 🙂 Some have a teacher section and some don’t. If they do it’s usually located near the kid school/art supplies. Good luck! It never ceases to amaze me how many different learning opportunities you can create with some Duplos! Math, Geography, the list goes on and on! Thanks for commenting Stephanie! I agree, we have to be creative and use all types of materials to engage our students. Thanks for this great idea. I’m having slight hysyerics at the thought of writing on my duplo so will stick a piece of clear tape on the block to write on instead! Ha ha Natasha! I know what you mean! Would it make you feel any better if I told you that the permanent marker eventually wears off after a few months of use? You can also use nail polish remover or hair spray to remove permanent marker from the blocks too. Excellent reminder Kathy, I had forgotten all about dry erase! Do they sell the 4 hole blocks by themselves? All I can find are sets like farm animals or Disney themes. Hi Tiffany! Yes, they do sell the blocks with 4 holes all by themselves. The set I mention in the post above is sold at Wal-Mart and called “Mega Blocks” the only blocks in that set are the kind pictured above, the chunky, square type. Hope that helps! Thank you so much .I will try it with my students.You are super. My 21/2 yr old boy is kind of moody. Now a days he love to build the tower using Mega blocks. I also have mega block with the animal sticker on it, I am encouraging him to put the alphabets on them, but he don’t like it. I loved your idea, will surely help him to learn lower case and upper case alphabets!! Thank you for the tips. u know what my 23 months old son kept on throwing the blocks instead of matching them. His concentration is too short.. and he rather messing up the blocks. How can I make him sit and focus? Your advise is really appreciated. Thank u.